Yesterday, one of my favorite royals -- the elegant Queen Mathilde of the Belgians -- celebrated her birthday. In her honor, we're devoting today to a glittering flashback to the 2017 Belgian state visit to Denmark. Enjoy the sparkle! In March 2017, King Philippe and Queen Mathilde of the Belgians embarked on a two-day state visit to Denmark, where they were hosted by Queen Margrethe II. 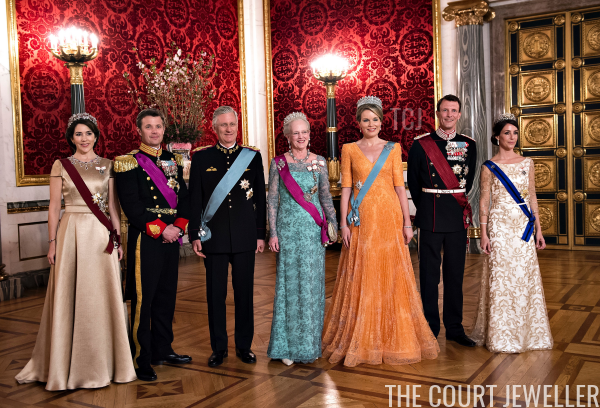 The event included a glittering state banquet at Christiansborg, attended by Queen Margrethe, King Philippe, and Queen Mathilde, as well as Crown Prince Frederik, Crown Princess Mary, Prince Joachim, and Princess Marie of Denmark. Queen Mathilde also wore her grandest tiara: the full setting of the Nine Provinces Tiara. The tiara, which was originally a wedding present to Queen Astrid of Belgium, is reserved for Belgium's queens (both regnant and consort). You can learn much more about the versatile tiara over here! With her tiara, Mathilde also wore a pair of diamond earrings that she often dons for gala occasions, plus a delicate diamond brooch. Crown Princess Mary also wore her most spectacular set of jewels for the banquet: the Danish Ruby Parure. Learn more about this important heirloom suite over here! The royals seated at the head table showed off a variety of order sashes. Queen Margrethe and Crown Prince Frederik wore the Order of Leopold (Belgium's highest order). King Philippe and Queen Mathilde wore the Order of the Elephant (Denmark's highest order). Crown Princess Mary wore the Order of the Crown (her highest Belgian order). Prince Joachim (not pictured here) also wore the Order of the Crown (his highest Belgian order), while Princess Marie (who is also not pictured) wore the Order of Leopold II (her highest Belgian order). You can see more of Joachim and Marie in our previous post on this banquet! Another of our favorite royals also celebrated a birthday yesterday -- stay tuned later today for even more birthday celebration jewels!